“Please, please, please write a blog on Evergreen Wisteria?? ?” I’m not a fan of wisteria. My father (tried) to train it to cover a patio in San Antonio. You’ve never seen a more God forsaken vine in your life. The yellow chlorotic leaves limply hung on sad little vines struggling in the limestone caliche. I was told that it had exquisite purple blooms in the spring. Never saw one. My father heard that if you shock wisteria, that it would burst into bloom. Even being sharply rammed with a lawnmower failed to persuade the thing to flower. But I digress. Susan has planted the most breath taking vine at the garden called—evergreen wisteria. 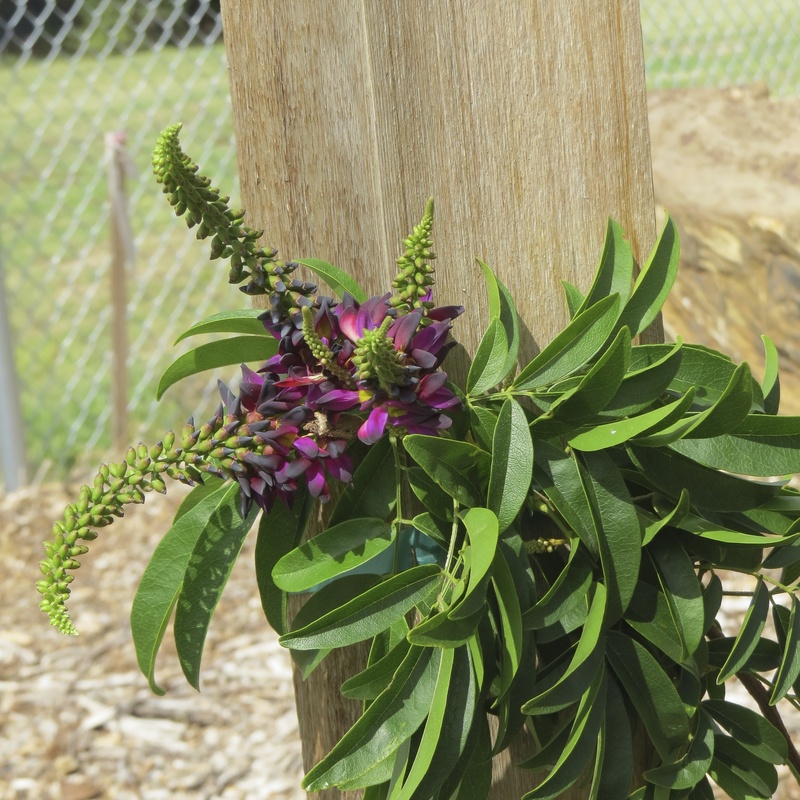 It has grown from a little start planted this spring into a stunner filled with purple blooms—and get this—it flowers mid-summer to fall when other more sane plants have thrown in the towel. 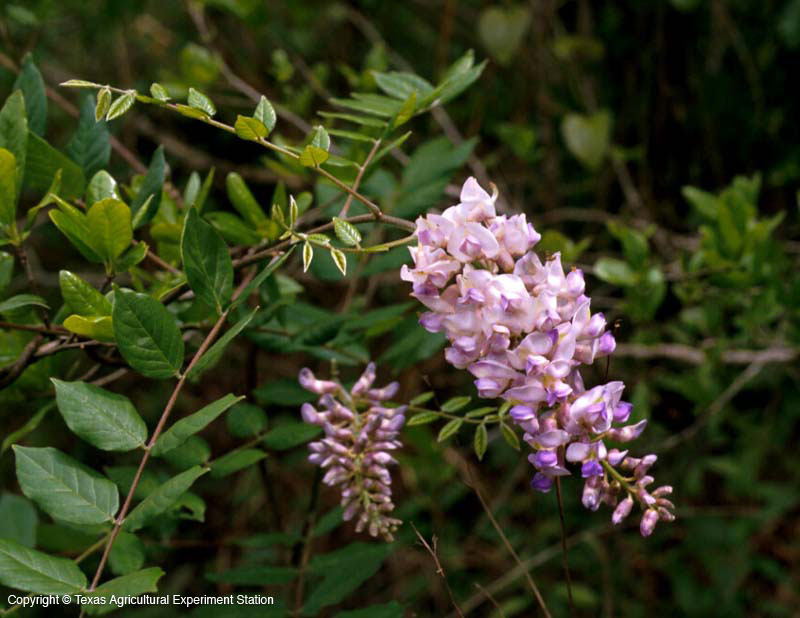 Wisteria gallops over companion plants, prompting Texas AgriLife Extension Agent Dale Groom to write, “Because wisteria has been known to literally take over other plantings, plant it on structures that are separate from other landscape locations.” In other words, if you can’t play nicely, you have to play alone. All 35 mature vining feet of you. Ah, but if you want the Southern Landscape Look, without the hassle, consider American wisteria Wisteria frutescens. It blooms in the spring, but is better behaved than its Japanese or Chinese relations. 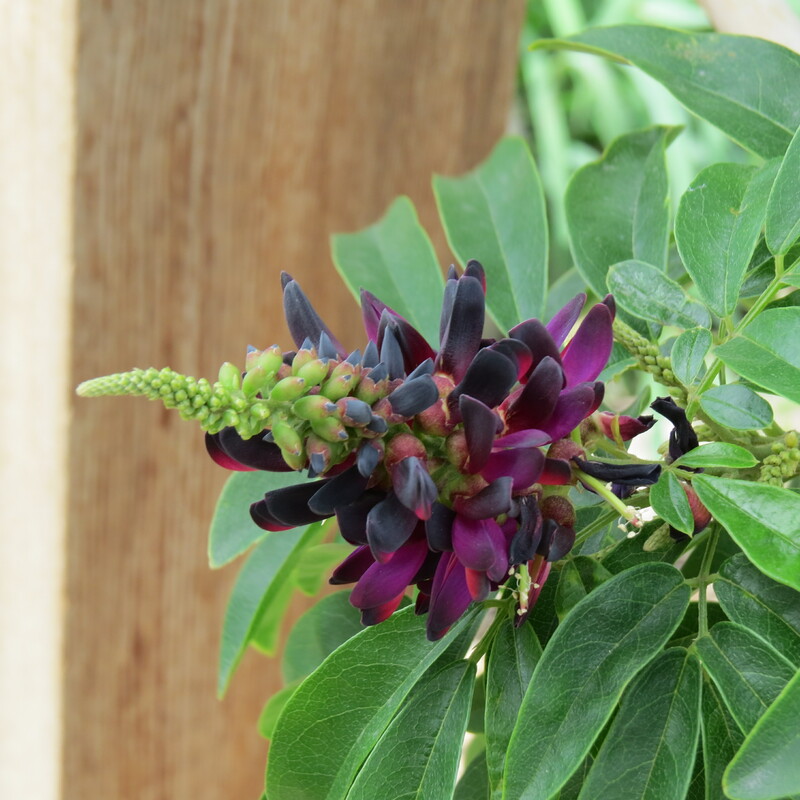 I’ll put my money on evergreen wisteria Millettia reticulata, which isn’t a wisteria at all. (Refer to my opinion of wisteria in paragraph two.) Its oval leaves are evergreen, and it blooms when everything else in the garden is gasping in the heat. At 15 feet tall by 10 feet wide, evergreen wisteria grows less than half the reach of Chinese wisteria. And the purple/magenta bloom is lovely. The vine is suggested for zones 8 to 10, so gardeners in colder climates would need to bring it into the greenhouse in the winter. You can observe Evergreen Wisteria growing at the garden and have a Harvest Lunch with us on October 29th. Details here. Posted in Vines for Texas and tagged Chinese wisteria, Evergreen Wisteria, Flowering Vine, Wisteria. Bookmark the permalink. You are correct that this is a lovely vine. But you didn’t mention that it also isn’t evergreen… at least not in Mesquite. But in a very mild winter it will keep its leaves. Even after our horrible winter last year, mine is alive and well and re-greening now. I love those purple (violet) blooms on the wisteria….very lovely. I have this evergreen wisteria. It grows like crazy and is very healthy and beautifully green, but it has not bloomed at all this year. It is 4 years old, gets plenty of sun but the blooms in the past have been very disappointing. I have even used Miracle grow for blooming plants with no luck. Any suggestions to get it to bloom? Should I cut it back in the fall?